Which of Sallinen’s works/recordings made you mark his name for further exploration? For me it involved a Swedish LP and a radio broadcast. The album is predictable enough. It was the pioneering BIS-LP-41 of symphonies 1 and 3 (Okko Kamu) and Chorali (Paavo Berglund). The broadcast was of a performance of the stunning Cello Concerto by Arto Noras who already interested me because he had recorded with smoking fervour the Bliss Cello Concerto for EMI and the Klami Cheremissian Fantasy for Finnlevy. Things moved on from there. My interest increased in this Finnish composer from a generation born two decades before Sibelius’s death. He was modern yet definitely not a swooning post-romantic. His music was characterised by stubborn heroics, discontinuous triumphs, terse, expressive ideas and a real lyrical proclivity. Crucial discoveries for me included hearing his Dies Irae broadcast from the Three Choirs in 1981, Shadows conducted by Bryden Thomson and the first UK performance of the Violin Concerto in 1982 with the BBC Scottish and Maurice Handford conducting. In 1986 I encountered Symphonies Nos. 2 and 4 with the BBC Welsh Symphony Orchestra again directed by Thomson in 1986. I was hooked. The barb became more deeply embedded with Finlandia’s Meet the Composer volume (8573-81972-2 - issued 1997) which presented the truly magnificent and very memorable Cello Concerto (Noras) and Symphonies 4 and 5 (Saraste and Kamu) among other things. That Warner label 2 CD set just pre-dated the launch of MusicWeb International. 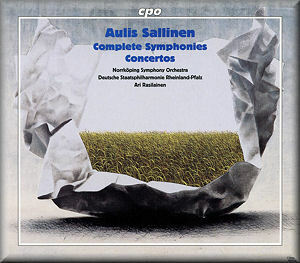 I have previously reviewed several of the five Sallinen orchestral discs issued by CPO and have been more than impressed by this Rasilainen-conducted set. The present Edition is the only game in town. There is nothing comparable. All eight symphonies are there, three concertos and clutch of smaller orchestral works. It’s a substantial set assembling five separately issued CDs released between 2002 and 2007 and housing them in a card sheath. The price ranges between £30 and £40 on Amazon representing some saving on the individual discs. The vertebra of these discs is Sallinen’s entire eight symphonies. The ‘missing’ concertos are the ones for flute (1995), violin, piano and chamber orchestra (2005), clarinet, viola (variant clarinet, cello) and orchestra (2007-8) and cor anglais (2010); all in due time though the flute concerto has been available on Naxos 8.554185 for quite some time. I will not comment on every work featured beyond saying that this set of discs evinces a serious and brilliantly executed intent. This was evidently a project that mattered greatly. Its presence on the market should be capitalised on by all enthusiasts iof this composer and of Finnish music and indeed of 20th century music at large. Cellular construction and iterative development of ideas are Sallinen hallmarks. These are apparent in the tense Fourth Symphony which also makes distinctive use of bells and percussion. Other broadly referenced moments link with Arnold, Prokofiev and Alan Hovhaness – especially the tumultuously baleful brass writing in the Vishnu symphony. The single movement Second Symphony is less successful as a symphony than its extraordinary flankers (symphonies 1 and 3 first recorded by Kamu on Bis). It sports a wide spectrum percussion array: marimba, vibraphone, crotales, tom-toms, bongos, Chinese temple blocks and gongs, military drum, side drum, suspended cymbal and large tam-tam. The Horn Concerto is subtitled Bells and Arias. It is classic Sallinen material with its frank lyric qualities, especially in the central movement, completely liberated by the decade's acceptance of melodic material. The horn sings autumnally as well as rasping and abrading in Britten-style fanfares. Everything is presented with a lucidity that is unafraid to reveal the work’s wonderfully engaging building blocks. Mauermusik or Wall Music was written in Köln in 1962. It is to the memory of a young East German who was shot to death for attempting to cross the Berlin Wall into the West. The work was premiered in 1964, not by Berglund, but by Ulf Söderblom in Helsinki. Written before Sallinen fully found his own voice and amid a dominant atonal conformity, this is a moving and desolate piece that, in its string writing recalls, the Penderecki of the 1960s. This is not the Sallinen we know but a young composer paying his dues to the norms of the time. The steely silvery awe of Shadows has a wandering Sibelian bass which transforms into a billowing cannonade of vehemently threatening sound. Symphony No. 8 – his last - speaks of anxiety-haunted exploration. The opening is spattered with sparse woodblock clatter under an awed brass-led largo. The bell finale is built from the notes of the name of the orchestra ConCErtGEBouw AmstErDAm. The title, Autumnal Fragments, relates to 9/11. The work ends in a calming yet stertorous funereal cortege that finally slides into silence. Sallinen is also renowned for his operas: The Horseman (1975), The Red Line (1978), The King Goes Forth To France (1983), The Palace (1991-3), Kullervo (1988) and King Lear (1999). Shadows has its origin in The King Goes Forth while The Palace Rhapsody's operatic sources are self-evident. It is scored for winds, percussion, harp and orchestra. It has a more candidly Sibelian tang. This thoughtful, brooding piece lit with flashes of brilliance is a work of line and continuity much more than the Eighth Symphony. We also hear what is the third recording of the Violin Concerto – this time from Jaako Kuusisto – a stalwart of Bis’s now completely achieved Sibelius Edition. There’s one on Campion coupled with the Sibelius and the irresistible but reactionary Janis Ivanovs' concerto; don’t miss it. The recording here is much more refined and also has greater grip at every dynamic level. This early work predates the wonderful Sinfonia which was his First Symphony. It is an intense song, very romantic in a modernist sense, somehow Sibelian without replicating the language. It is not 12 tone but feels modern and the zither and harpsichord encapsulate this at the start of the second movement. Its flood of incident and imagination certainly fascinates. Chorali dates from 1970 and was conducted by Berglund on that first Bis LP. It sounds just as vivid here. The Seventh Symphony The Dreams of Gandalf predictably owes its inspiration to Tolkien. It recycles material from an abortive The Hobbit ballet Sallinen once had in hand. The composer says that the music is an expression of literary atmosphere and poetry: heroic and legendary, mysterious and meditative – I have appropriated Hubert Culot’s apposite words here. This fantastic music ends in calm. The King Lear piece draws on material from the opera and is completely in keeping with its sombre, tragic and minatory subject. I would also refer you to Hubert’s review of Sallinen’s The Barabbas Dialogues. It is on a separate CPO which is not included in the present set. Recording and production values throughout are excellent: open, vital and lively. Rasilainen and his orchestras and soloists appear confident and virtuosic and their fidelity to the composer’s vision is suggested if not guaranteed by the supervising presence of the composer during these recordings. The annotation is in the stylish and well-informed hands of Martin Anderson. It runs counter to CPO's tendency towards a congealed dissertation style - an effect usually exacerbated by translation into English. These eight symphonies form one of the building blocks of Finish and world culture. Far from being merely significant they also deliver a fine, virile and far from effete imaginative contribution to the two centuries in which this music was created.